In a previous article here, I discussed the ways to find flights that you can use your Aeroplan miles to purchase. Sometimes the search engines like to mess with your head and tell you there isn’t any award availability when there actually is. If you are looking for a flight and the search engines say there is no low level award availability, there are ways to be creative and check some alternative routes. In this article, I’ll show you a process to piece together your own routing for an itinerary even when the search engines tell you there isn’t any availability. In October 2012, my friend asked me to help find a flight from Toronto to San Francisco the weekend after Christmas. We had checked the search engines of United.com and Aeroplan.com for flights and were originally going to put him on a direct flight on Jan 4. Unfortunately, by the time we went around to booking it, the flight was gone. Using these methods, we were able to piece him together the following itinerary that none of United.com, Aeroplan.com and ANA.oc.jp suggested. 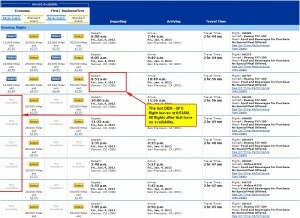 United.com shows no economy (Saver) availability for YYZ-SFO on January 4, 2012. When trying to piece together an itinerary, I think the best thing to do try to find out if there are award flights into and out of the hub cities of your carrier. 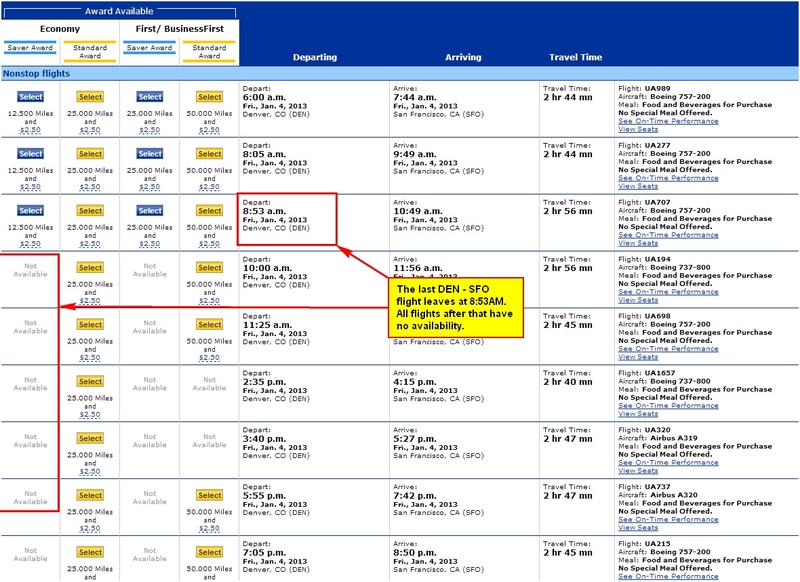 I personally prefer using United.com for searching this, because it shows the details of the flights. Knowing the legs that have availability can help you find flights. When flying within North America, I like to use a process of checking flights going through the hub airports of each of the 3 Star Alliance Carriers. Note that you can use really any airport as a connection that works. There are just so many more flights through the hub airports that you should focus on these ones first. You need to make sure that you have a flight to your hub and a flight from your hub and you have to be able to connect them. I like putting into an organized spreadsheet like this one. Los Angeles / LAX Available Available Success! 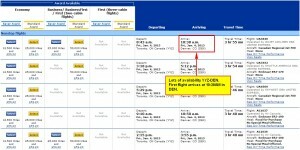 Let’s go through the process of finding if there are really are award flights at what United calls “Saver Economy” (yellow or green) for Toronto – San Francisco on January 4, 2013. We want to see if we can find a series of flights, all at the 12.5k economy level that will get us from Toronto / YYZ to San Francisco / SFO on Jan 4. We want to book these using Aeroplan miles and we want to keep the fees low, so we are going to try to avoid Air Canada where possible. We will start with United hub cities first so we are more likely to find United operated flights so we can avoid the fuel surcharge. Unfortunately, it is pretty tough to get from YYZ-ORD in time for a 6:21am flight to Los Angeles / LAX. (we might be able to use the fact that the Chicago flight wants to route us via LAX). 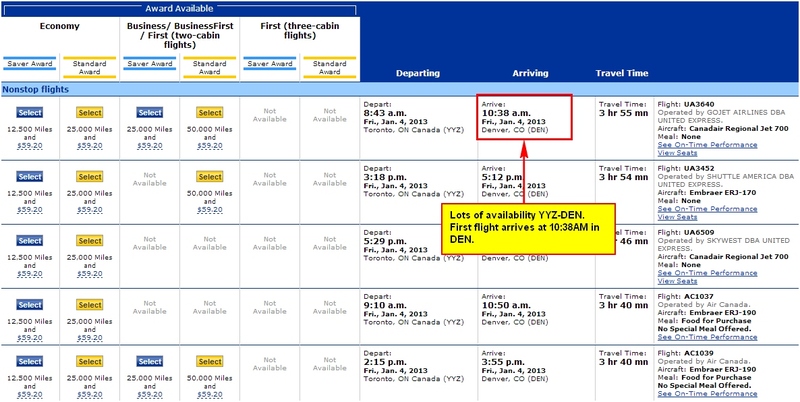 For YYZ-DEN, we get lots of availability, with the first flight arriving at 10:38am in Denver. For DEN-SFO, unfortunately, there are no flights at the low level that leave after 10:38am, which means we can’t use DEN as an option. It looks like when we try to connect, we are misconnecting because the flights going west leave too early. Let’s see if we can get west to Los Angeles and try to get to San Francisco from there. (we can use the fact that LAX was a suggestion made to us when we were checking the Chicago flight). On the YYZ-LAX flight, we can get to Los Angeles by 11:29am. United has suggested we go via Washington / IAD. Next, we have to see if there are any flights LAX-SFO that we can make given that we will land in LAX at 11:29am. It looks like we can take the 1:55pm flight leaving LAX and we will be fine. Once we have a reasonable itinerary, we have to make sure that it is within the routing rules. The only issue we would need to check would be if we are crossing a border unnecessarily. In this case, the itinerary crosses into the US once (YYZ-IAD) and then remains in the US. This is acceptable. We have to worry about the minimum connection times at our 2 connection airports: IAD & LAX. At IAD, there is a 54 min layover, and at LAX, there is a 2 h 26 min layover. Both of these are acceptable from these airports. If you are unsure, you can google for minimum connection times at your specific airport. We will need to make sure that the routing we take is not going too far out of the way, and is within the Maximum Permitted Mileage (MPM). There are no free resources to find out what the MPM for a route is (that I have found) so I just use some logic to figure if a routing would be acceptable. The Great Circle Mapper, claims that our routing YYZ-IAD-LAX-SFO is 2971 miles. Since our MPM can be exceeded by up to 25%, the MPM for this route has to be more than 2377 miles. There are clearly acceptable options greater than the minimum MPM of 2377, so our routing having an MPM of 2971 is definitely not exceeding the MPM. Even if you are close to exceeding the MPM, most of the time an agent will let it go through. From this exercise, we see that you can put together your own routing that might not be suggested by the search engines. Unfortunately, this will have to be booked via telephone. At that point, we can confirm that this is a valid routing (it is) on the phone and if the agents say it isn’t, we can figure out what we would have to change. When you are trying to get an award ticket booked but the search engines just wont give you a flight, you can try to piece the award flight together yourself. What you should do is try to find availability on each leg individually. Use the hub airports of your preferred carrier as connection points and search for seats that can get you all the way or part of the way to your destination. Be aware of geographic restrictions, minimum connection times and the maximum permitted mileage along with the rules of the Aeroplan, for example, program. Next time you are looking to book an award ticket and you can’t find availability, use this technique and you may end up finding a flight you like. Hey there thanks for this wonderful article! Quick question about MPM, if I were to fly from YVR-YUL-MIA, would this be acceptable in terms of MPM? I did the math and it seems like it is over 10%, but seems like a very reasonable stopover. That would definitely be ok (according to the rules). It is a natural connection point anyways, so I dont think MPM would even be a consideration. Don't subscribe All Replies to my comments Notify me of followup comments via e-mail. 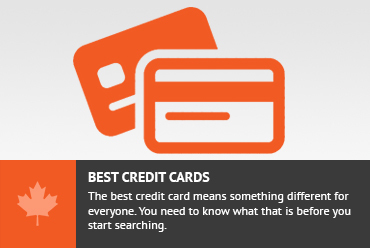 You can also <a href='https://www.creditwalk.ca/comment-subscriptions/?srp=557&srk=2648578ecea05c83754707575dc5a494&sra=s&srsrc=f'>subscribe</a> without commenting.